Taken from here and excerpted from Gorz’s Critique of Economic Reason: Summary for Trade Unionists and Other Left Activists. 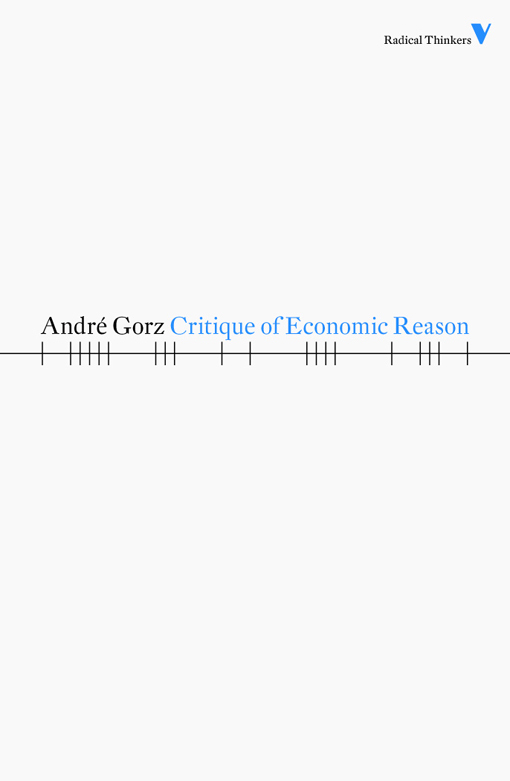 Andre Gorz’s, “Critique of Economic Reason”! Workplace struggles have not lost any of their significance but the labour movement cannot afford to ignore the fact that other struggles, in other areas, are becoming increasingly important as far as the future of society and our regaining control over our own lives is concerned. In particular, the labour movement’s campaign for a reduction in working hours cannot ignore the fact that the unpaid work done by women in the private sphere can be as hard as the labour which men and women have to put up with to earn their living. The campaign for a shortening of working hours must, then, go hand in hand with a new and equitable distribution of paid work amongst all those who wish to work, and for an equitable redistribution of the unpaid tasks of the domestic sphere. The trade-union movement cannot be indifferent to the specific women’s movement campaigns on these questions and it must take these into account when determining its own courses of action, especially with respect to the arrangement and self-management of work schedules. If they see their sole task as that of defending the interests of those with stable jobs, the trade unions run the risk of degenerating into a neocorporatist, conservative force, as has occurred in a number of countries in Latin America.The task of the trade-union movement, if it wishes to survive and grow as a movement promoting individual and social liberation, must, therefore, be to extend its sphere of action beyond the limited defence of workers as workers, in their workplaces, much more clearly than it has done in the past. Trade unions will only avoid becoming a sectionalist, neo-corporatist force if the segmentation of society and the marginalization of a growing percentage of the population can be prevented. If this is to happen, an ambitious policy for a continual, programmed reduction in working hours is indispensable. Trade unions are incapable of implementing such a policy on their own. But through their campaigns they can ensure that the necessity for such a policy is accepted and, more importantly, they can adopt it as the objective governing their actions and their social project. A project for a society in which each can work less so that all can work better and live more becomes, today, one of the principal binding elements of social cohesion. The traditional task of the trade unions is as relevant now as ever. For although the employers’ ideology sets great store by the reskilling and personalizing of jobs and the policy of giving workers greater responsibility, in practice this revaluation of labour only affects a small and privileged elite. It thus becomes essential to ask ourselves what purpose we serve by the function we fulfil at `work’. Professional consciousness must therefore extend to include an examination of the effects technological, economic and commercial decisions have on society and civilization, and the issues that are at stake. This is especially necessary in the case of technical and scientific workers, whose associations and groups have been known publicly to question the moral and political aims, values and consequences of the programmes they are to implement. More than at any other time, the influence of the trade-union movement depends on its ability to contend with the cultural industry and the entertainment or leisure moguls, so as to break the monopoly they are aiming to acquire over consciousness-formation and our conception of future society, life and its priorities. The trade-union movement’s cultural task is really a political one, if we give `political’ its original meaning of an activity relating to the organization, future and good of the `city’. The trade union movement should also not ignore the Struggles which have developed in the last fifteen years or so in areas outside work. These campaigns, which are extremely varied in nature, are all characterized by the aspiration of individuals and communities to regain existential sovereignty and the power to determine their own lives. These campaigns have a common target: the dictatorial rule industry and the bureaucracy exercise in alliance with professions whose aim it is to monopolize knowledge in areas as diverse as health, education, energy requirements, town planning, the model and level of consumption, and so on. In all these areas, single-issue movements – the `new social movements‘ – are attempting to defend our right to self determination from forms of mega-technology and scientism which lead to the concentration of decision-making power in the hands of a technocracy whose expertise generally serves to legitimate the economic and political powers-that-be. A progressive reduction in working time to 1,000 hours or less per year gives completely new dimensions to disposable time. Non-working time is no longer necessarily time for the rest, recuperation, amusement and consumption; it no longer serves tocompensate for the strain, constraints and frustrations of working time. Free time is no longer merely the always insufficient `time left over’ we have to make the most of while we can and which is never long enough for embarking on a project of any kind. Continual hard slog does not make work more creative or more efficient; it only serves the will to power of those who defend the rank and the position of strength their work affords them. It is rare for pioneers, creators or high-level researchers to be at workfor more than 1,000 hours per year on average. Experience has shown that two people, sharing a single position of responsibility (for example, as a dean of a university, a personnel manager, a legal adviser, a municipal architect or a doctor) and doing two and a half days each, do the job better more efficiently than one person doing the same job full-time. The third formula for making the level of income independent of the amount of labour supplied is the reduction of working hours without loss of income. This proposal reconciles the right of everyone to have a paid job and the possibility for everyone to have a greater degree of existential autonomy and for individuals to exercise more control over their private, family and community lives. This proposal is most closely in keeping with the trade-union tradition. While the demand for a guaranteed social income is asocial policy demand addressed to the state, and one which trade unions can neither carry through by direct mass action nor implement themselves through workers’ control, the demand for a reduction in the working week to thirty-two, twenty-eight, twenty-four or twenty hours, without loss of real income, can be campaigned for through collective action and, more importantly, can create solidarity between workers, the unemployed and those people – a significant number of whom are women and young people – who wish their jobs to fit into their personal lives instead of requiring the sacrifice of the latter. – the savings in labour which technological development has created must benefit everyone;– everyone must be able to work less so that everyone can work;– the decrease in working hours must not entail a decrease in real income, since more wealth is being created by less labour. These are not new aims. There is no shortage of collective agreements, and sectoral or company agreements which have, in the past, made provision for a progressive reduction in working hours accompanied by guarantees of purchasing power and a stabilization, if not indeed an increase, in the size of the workforce.What is new is the fact that the technological revolution is now affecting all fields of activity and bringing about highly differentiated savings in labour. This will continue over a long period. Trade-union action is indispensable if we are to achieve reductions in working hours which correspond to the predictable rise in productivity: indispensable, in particular, if the reductions in working hours are to lead to employees being able to self-manage their time and not merely to more flexible-time on the employers’ terms. But trade-union activity is not enough to effect a planned reduction in working hours by stages across the whole of society. This calls for specific policies which very much concern the trade-union movement but which cannot be conducted and implemented by it. These specific policies must focus on four areas: forecasting and programming; employment; training; and financing. I have attempted to identify the meaning history could have, and to show what humanity and the trade-union movement could derive from the technological revolution we are witnessing at present. I have tried to indicate the direction in which we should advance, the policies we should follow if we are to bring this about. Events could nevertheless take a course which would miss the possible meaning of the current technological revolution. If this happens, I can see no other meaning in that revolution: our societies will continue to disintegrate, to become segmented, to sink into violence, injustice and fear.